Years ago I entered an "open" tournament. All the quasi karate styles were represented there: kung fu, kenpo, tae kwon do, you name it. I saw uniforms of every imaginable design on these competitors. Some wore hakama (garb originally worn by samurai) and a few were donning something similar to a Roman toga! Still another entrant wore just a T-shirt with his school logo embossed on it. I actually felt out of place with my plain white karate uniform. The unadorned white gi (uniform) is generally regarded as part of martial arts tradition. Really, defining tradition here is an iffy undertaking given the fact that many systems of empty-handed combat were devised barely more than a century ago. And since the martial arts seem to be in a state of constant flux, what practitioners wear for training apparel has also been subjected to change. It was Judo's Jigoro Kano who introduced the white gi in 1907, but the idea didn't catch on with other styles until some time later. So the wearing of the gi is a relatively modern development in the martial arts. When Gichin Funakoshi demonstrated karate in Japan for the first time around 1920 he wore a judo gi and adopted judo's colored belt system in an effort to encourage Japanese participation. Kano's original belt grades were just white and black. Later, brown was added to denote an intermediate level. The first school I trained in had white, yellow, green, brown and black belt levels, and for many years that's all there was. Eventually more were added, including orange, blue and purple. Now we also have camouflage belts, and before you know it we'll probably have mauve and chartreuse belts walking around. Then there are the patches. Most schools require that you wear an organizational patch or one that symbolizes your style. I see nothing wrong with that, but as a rule of thumb less patches are better. Some of these new players, especially in Brazilian jiu-jitsu, wear more emblems on their uniforms than you would find on most NASCAR stock cars. Longtime karateka Charles Goodin recently wrote a brief article on uniform patches whereas he feels that all of them are tawdry and unnecessary. Some of his points are well taken, but I feel that one or two on your gi is fine. I usually have three of four karate gis at my disposal, if for no other reason just so I have a clean one to wear to every class. Always arrive wearing a washed and unwrinkled uniform if you want to remain in good standing at your school. I actually saw an adult student get sent home once because his gi was absolutely filthy (and he stunk to high heaven). When you buy a new uniform, make sure you hem the pants length before you come to class so you don't trip over the excess material while you're working out. Your uniform is an expression of you, so take good care of it and wear it proudly! I've blogged before on this subject, but I will say that there is nothing more disrespectful to a training partner than a lack of hygiene. With ringworm or staph a very real threat to all grapplers, this is even more true. I also have several gis I cycle through and would never wear a dirty one to class. Having long unhemmed pant legs are SUCH a danger to you! I've watched people stepping onto the material instead of the floor and then slipping into treacherous balance ( almost flipping over head over tea kettle!) Also, these practitioners were constantly lowering their guard to pull up their pants while sparring. What a nasty habit! Down go the hands, and the head is in a total "hit me in the head, please, I want to see stars.." moment. Personally, I prefer the plain white gi over all of the decorated outfits out there. I would be open to wearing a plain black gi due to the fact that the color black can take on more dirt, and stains without looking dirty. My white gi doesn't look very white after some classes. But other color choices are not allowed in my style, so I am limited to white. I also have several gi that I cycle through. I make every effort to wear a clean, and ironed gi to class for my own health, and safety, and for the protection of others from infections, and needless suffering of bad odors. For Japanese martial arts, plain white dogi, period. You might remember that considering that this is "martial arts", it is not uncommon for martial people, aka militia, are full of uniforms that denote ranks and other denominators of who they are. That still exists in the modern military. Within reason, I don't see why that would be a problem in martial arts, since they derived from the idea of the military. I can't speak about other TKD associations, but the one I belong to does have several designations, but it's all standardized (or at least it's supposed to be). For example, beyond the belt ranks, There are also collar ranks to denote your level of teaching level, and there are patches that denote your certification of what level judging you are allowed to do at tournaments. It does serve SOME purpose. A lot of marketing is now being used in gi's. 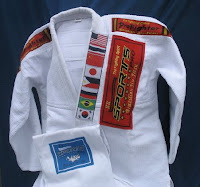 A lot of Jiu jitsu (brazilian) tend to have lots of labels on there gi's. The standard white, and blue (for competition purposes only) should be the norm. Good post! 2 with the chito-ryu crest, 1 for competition, 1 for grappling. I think it's enough. What's wrong with white? everywhere, black, red, blue, purple gi's are sprouting. It's sometimes used as a statement too. I'm tough yo! If you were in my karate school you'd better have ALL your patches on or you risked doing about a couple hundred more push-ups than everyone else. Yes, punishment for not having all the patches. I think there were 4 or 5 required patches. All the "quasi" styles? Who defines the objective "true" karate style? I pretty much agree with your point (to an extent), but that opening line really conveys an air of self-importance. All the "quasi" styles?...that opening line really conveys an air of self-importance. Not at all. It's just a matter of semantics. Quasi in this sense means "near" or "akin to", as opposed to fraudulent. By definition traditional karate styles were/are founded by natives of Okinawa or mainland Japan. Quasi-karate then is an appropriate and respectful term to use to describe arts that are indigenous to other cultures that may be similar to - but not karate. You could just as easily call karate "quasi-tae kwon do", although that would be a bit silly. Bear in mind that for many years TKD was referred to as Korean karate just so laypeople would have a basic idea of what it was.